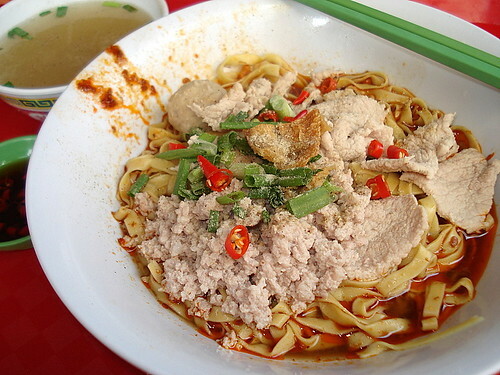 Mee Pok Tah - mai ter kua (dry noodles, no liver please! ), originally uploaded by Camemberu. 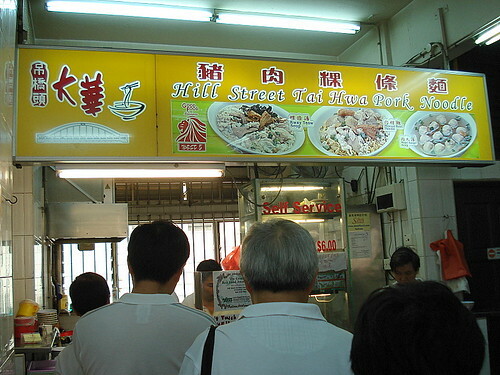 Finally the legendary Hill Street Tai Hwa minced pork noodles! Here's my S$4 bowl of mee pok (flat egg noodles) done dry style with chili. I requested the omission of pork liver (liver is yuck, unless it's foie gras). I had the great fortune of lining up hungry and behind an auntie who ordered like 8 bowls. But soon, patience rewarded me with my bak chor mee (BCM; minced pork noodles). 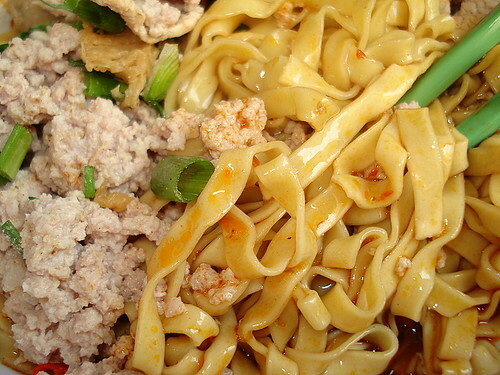 Al dente noodles cuddling next to white fluffy minced pork, originally uploaded by Camemberu. True enough, the noodles lived up to their reputation for being al dente. They were thick and slippery, awash in sauce - good to slurp, although I personally prefer thinner and drier mee pok. Ingredients also very fresh - the minced pork and sliced pork were both snowy white. I'm not a fan of vinegar in BCM but I can see why the hordes love the premium black vinegar used here (which is thankfully not too overpowering). The chili sauce is not very hot here (even the sliced chili padi does not bite). What's really good is the soup - sweet, robust and tasty (even though it reeked of liver a little). Luckily the queue was not too long when I was there, originally uploaded by Camemberu. OK la, now I can say, "been there, done that" - it was a good bowl but I was still a little underwhelmed. Next time I will try the S$5 or S$6 bowl for more ingredients, without vinegar and ask for more meatballs to replace liver (instead of just one miserable ball). And oh yes, lots lots more fried pork lard pieces (for a while I thought this stall didn't use them, they were so few and so tiny in my bowl)! The neighbouring Happy Chef western stall looks good (I detected delicious sounds and aromas from a sizzling steak). Will definitely have to try that one as well. i hope its ok i used your mee pok photo here http://www.thebudgettraveler.org/8-must-try-food-in-singapore/ but linked to your site. I am starting a travel blog but haven't finished writing about my top 8 food in singapore.